Indian economy entered the new fiscal year 2018-19 (FY 19) on a strong footing. The GDP is projected to be in the range of 7.3-7.7% in FY19 with the RBI pronouncing that the gap between actual and potential growth has been nearly closed. Industrial production and capacity utilization are rising and the credit cycle is reviving. Some risks are present though. Consumer price index (CPI) inflation – the indicator followed by the Reserve Bank of India (RBI) for policymaking – is projected to be in the range of 4.3-5.1 percent. 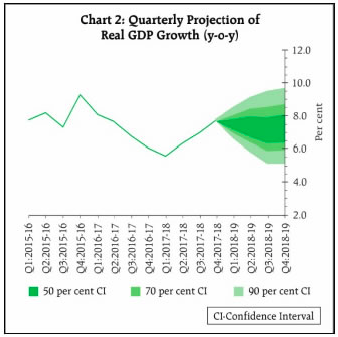 In April-May – the first two months of FY19 – the budget deficit for FY19 has already touched 55% of the target of 3.3% of FY19 projected GDP and it is yet to be seen if in this year the government can meet its budget deficit target. The current account deficit (CAD) in the 4th Quarter of fiscal year 2017-18 (FY18) has widened to 1.9% of FY18 GDP. CAD data for the 1st Quarter of FY19 is yet to be released. Unemployment is turning out to be an issue for the government despite the strong GDP growth. In the second bi-monthly monetary policy meeting in June, the RBI has raised the policy (repo) rate by 25 basis points citing inflationary trend. Should inflation rise further up and away from the RBI’s medium term inflation target of 4%, more rate hikes can be expected given the strong growth and inflation and inflationary risks such as minimum support prices (MSP) for farmers, budget deficit and CAD. These macro risks to the Indian economy, primarily the risk of rising interest rates, together with cues from the global macro environment discussed below, have put a consistently downward pressure on the Indian financial markets. 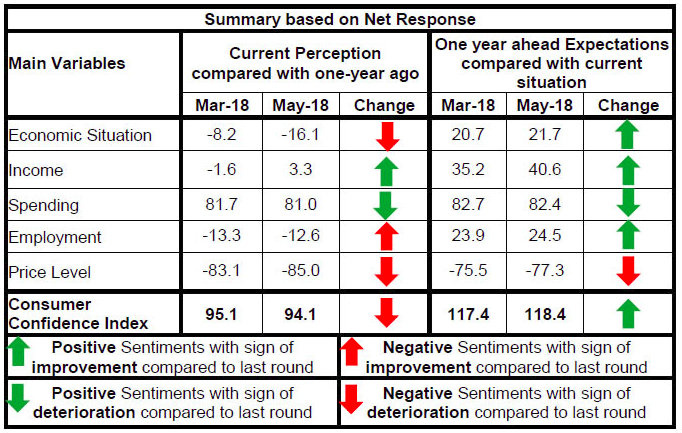 Consumer confidence, according to the RBI, has improved though the expectations of consumers about spending and inflation have somewhat deteriorated in the period from March 2018 to May 2018 (Source: RBI, June 06, 2018). The Indian basket of crude oil represents a derived basket comprising of sour grade (Oman & Dubai average) and sweet grade (Brent) of crude oil processed in Indian refineries in the ratio of 72.38:27.62 during 2016-17 (Source: Petroleum Planning and Analysis Cell, Ministry of Petroluem and Natural Gas, Government of India). The oil price of the Indian crude basket in the table is the average of daily prices of the respective month. Oil price has risen because of effective supply cut (due to supply distruptions in Venezuela, Libya and Angola) by OPEC and Russia of about 2.8 million barrels per day (bpd) though the target was only about 1.8 million bpd. The inventories have come down and the market is currently tight with supply barely meeting demand despite shale oil production in the US. Prospective re-imposition of sanctions on Iran by US by November is also expected to bite into the supply. It is expected that OPEC and non-OPEC will pump more crude of about 1 million bpd which can only alleviate the market tightness so much. High oil price is already proving to be inflationary for India contributing to downward pressure on the markets. More about supply will be known when OPEC meets again in December of 2018. Until then the high oil price is here to stay for India, having a negative impact on its CAD and the rupee which has depreciated against the US dollar breaching INR 69 toward the end of June as can be seen from the chart below for the quarter April-June 2018. When they come into effect, tariffs by the US on imported goods from Canada, Mexico, EU, China and some on India and retaliatory tariffs by the affected countries on US goods is threatening to raise prices, slow global trade and slow the global economy. However, tariffs appear to be US president Trump’s way of negotiating a free, fair, reciprocal and balanced global trade regime with low or no tariffs and lowered or no non-tariff barriers. This global trade war by US on its trading partners is expected to last for the rest of FY19 before any agreements are reached by the various countries with the US on trade, putting downward pressure on the markets particularly in China and the EU. Emerging market currencies are under pressure because of rising interest rates in the US. Foreign Institutional Investors (FIIs) are withdrawing money from the emerging markets and repatriating the dollars to the US and this combined with the high oil price is weakening the Indian rupee against the US dollar which has strengthened due to a strong US economy. What to Expect in the July-September Quarter from the Financial Markets? Pressures that would weaken the macro factors are expected to continue in the July-September quarter. Government spending in India such as on MSP and health insurance for the poor could rise because of the upcoming elections in 2019 pressuring the budget deficit though the budget deficit of India has remained well contained since 2014 because of the growing economy and tax reforms such as the Goods and Services Tax (GST) which are improving the tax receipts of the government. Though China is the country to be most adversely affected by the trade war with the US, any Chinese financial market downturn may not spillover into the Indian markets. In fact, India could stand to benefit from the US-China trade tiff because of the lowering by China of tariffs on Indian exports to China to source some goods as an alternative to US exports to China. Should the US dollar strengthen further and the oil price remains firmly in the USD 65-80/barrel range and closer to USD 80/barrel (or above), rupee can be expected to depreciate further to about INR 70/USD. This would be good for Indian exporters but threatens to weaken the Indian macro situation because of the prospect of higher interest rates to contain inflation and the burning of forex reserve dollars to pay for CAD and to put a floor under the rupee, further pressuring the Indian financial markets.